Mirrorgaze is a smaller, leaner, and all out thinner cat than most, she has a dark coat that is a shadowy gray with jet black and darker grey splotches like a calico pattern all over her pelt, with rings on her tail, and paws, ears, tail-tip, and muzzle dipped in a creamy dark black, the darkest colors on her body. She is just like a shadow, you never know she's there unless she makes herself known or you look for her. She has giant misty grey eyes that one can always see his or her reflection in. She loves being a medicine cat. She loves to find out new ways of curing other cats and hates fighting and hunting, but loves battle tactics and the only way she would hunt was to set traps with nightshade to kill prey. Mirrorgaze is very grumpy and moody, and she is not liked by the apprentices and kits because she can be short and rude. Mature beyond her years, she is the youngest cat ever to be made a medicine cat, and she is very proud of it. Sometimes, even full grown warriors are scared of her. She is a favorite of Fallenstar and is very gentle and sweet with her friends, and is also very outgoing and dryly sarcastic around the cats she loves. Ok so when shall the med cat gathering should be? I can't do Friday, and I pretty sure I can't do Thursday either it kinda depends on my homework load. Any ideas when we should do the the med. cat gathering? I am busy this week with projects and studying for finals and homework. This weekend I have a swim meet, but I can still do the gathering. I think. I'm open from Wednesday to Friday, next Monday to Friday... And then I won't be on for a week. My decipleship group is going on a mission trip to New York so I won't be around. 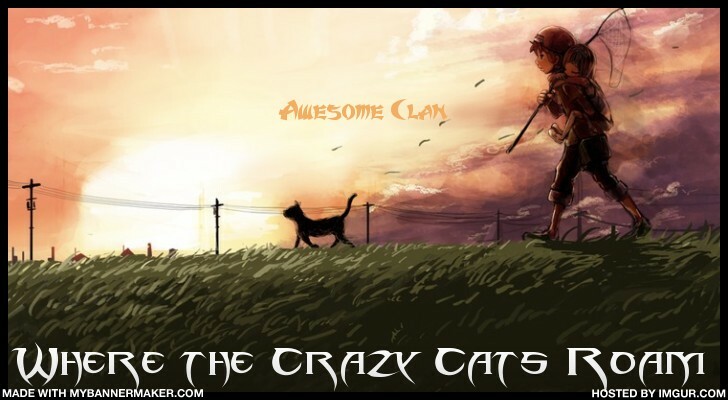 To stir some excitement up there will be a new sickness in the clans, but it will be mostly in Sunclan. Any ideas on what it should be? Ok what would be a cure and what is it exactly? I think Flame put Falter in because it might be the sickness makes cats stop, and eventually stop moving forever or something like that. Maybe it should be tons of excersize since the sickness makes cats "stop". Or maybe it should have something to do with "absorbing" the sickness by using leaves or something. How about using leaves that absord the sickness but you also need to excerise because the levaes aren't always reliable and they are hard to come by so you need to excerise a lot! I was thinking the herb could be the herb chickweed which also heals green cough. Okay so how about we make some more sicknesses? They have greencough and whitecough and blackcough(the even more deadly from of greencough) but they are not as rare since they live in the tropics and it is almost unheard of someone dieing from that or even getting it in the first place. So since it is hot there I decided we should have fever instead. They don't have normal fever they should have different types and they should do different things, beside making them hot. Any ideas for symptoms and names and cures? Bluefever-A fever that makes you tired and sleepy and makes simple activives like crossing the camp a big deal. Redfever-A fever that makes you cough up blood and you get a sore throat as well. Purplefever-A fever that makes you have illusions and visions and werid dreams as well as makes you throw up. Do you like? We can add onto this and we can also make anew. They are all different and are not connected. Also we should begin working on a new herb page that shows where the herbs can be found and how easy it is to find them. I will post on the Herbs!!!!! page so you can reach it more easily and then we can begin working on that. Also is it okay if the next med cat gathering is on the 23rd? Okay then how about....the 22nd, next friday or the 21st? I think the 21 st woreks better for me but I am not sure at all! Let's go with the 21st. That day works for me too. Ok so the 21st then! Ok so we need to get some work done! We need to work on the herbs and list where they can be found and how easy it is to find them! Here they are! Alder Bark-The bark is used to treat cats who get toothaches, and the pain may heal. Beech Leaves-Medicine cats use beech leaves to carry herbs around. Blackberry Leaves-These leaves are chewed into a pulp to treat bee stings. Borage Leaves-It is easily distinguished by its small blue or pink star-shaped flowers and hairy leaves. When it is chewed and eaten by nursing queens, it produces more, better milk. It also brings down fevers. Burdock Root-Tall stemmed thistle with a sharp smell and dark leaves. When the root is dug up and the soil is washed off it, it is chewed into a pulp, and put on wounds inflicted by rats to keep them from becoming infected. Can also be used on infected rat bites to lessen and heal the pain. Catmint/Catnip-A leafy and delicious-smelling plant. They are rarely found in the wild, and are mostly found in Twoleg gardens. Best remedy for the deadly greencough, which kits and elders usually catch in the season of leaf-bare. It is also the best remedy for less deadly Whitecough. Celandine-This herb can be used to soothe the eyes if ever damaged. Chamomile-A small, white flower with a yellow center, this herb can be used to strengthen the heart and soothe the mind. Also used in a concoction given to travelling cats for strength. Chervil-A sweet smelling plant with large, spreading, leafy, fern like leaves and small white flowers. The juice of the leaves can be used for infected wounds, and chewing the root also helps with bellyache. Chickweed-Like catmint/catnip, it can be used to treat greencough though often times catmint is much preferred. Cobwebs-Very common in the forest, just be careful not to bring the spider along with you! Put it on a wound to soak up and stop (or slow) the bleeding. It may also be used to bind broken bones. Coltsfoot-A flowering, dandelion-like plant with yellow or white flowers. The leaves are chewed into a pulp, and given to cats with difficulty breathing or a cough. It also can be used to treat kitten-cough, as well as cracked or sore pads. Comfrey-Large leaves and small shaped flowers, which range in color from pink, white, or purple. Its fat, black-colored roots, when chewed into a poultice, can be used to repair broken bones or to soothe wounds. Daisy Leaf-Daisy Leaves are thick, dark green, oval shaped leaves. Chewed into a paste, it can help aching joints. It is also a travelling herb. Dandelions-The white liquid inside the stem is used for bee stings. Its roots can also be chewed to act like poppy seeds. Dock-Similar to sorrel, the leaves can be chewed up and applied to soothe scratches, although it may sting when being applied to a wound, and it has a very tangy scent and taste. Dried Oak Leaf-Most readily available in autumn/leaf-fall, the leaves are stored in a dry place, and can stop infection when applied. Feverfew-Small bush with flowers like a daisy. The leaves can be eaten to reduce body temperature, especially cats with fever or chills. Also heals aches and headaches. Goldenrod-A tall, plant with bright, yellow flowers. When chewed into a poultice, it is good for healing wounds. Heather Flower-It can be included in herbal mixtures, to make it easier to swallow. Honey-A tasteless, golden-colored liquid that is created by bees. While difficult to obtain without being stung, it is great for soothing infections,sore throats, or cats who have breathed smoke. Also helps cats swallow other medicine. It is given to cats using wads of moss soaked in it. Horsetail-A tall, bristly-stemmed plant that grows in marshy areas. The leaves can be chewed into a poultice, and applied to infected wounds to help treat them. Ivy Leaf-Medicine cats use ivy leaves to store herbs. Juniper Berries-Juniper berries grow on a bush with dark green, spiky leaves. The berries are purple in color, and can soothe bellyaches, give strength, and help troubled breathing. It is also used to help calm cats. Lamb's Ear-Commonly found in the mountains, this herb gives a cat strength. Lavender-A small, purple, flowering plant that cures fever and chills. Mallow-The leaves are best collected at sunhigh, when they are dry. It soothes a cat's belly. Marigold-A low-growing flower that is bright orange or yellow in color. The petals or leaves can be chewed into a pulp and applied to wounds as a poultice to stop infection. It could be used to treat rat bites, but it's sometimes not strong enough. Mouse Bile-Extracted from the mouse. The only remedy for ticks, mouse bile is foul smelling, and is stored in moss. When dabbed on a tick, the tick falls off. Smell can be masked by wild garlic, or by washing paws in running water. If accidentally swallowed, can leave a horrible taste in mouth for days. Medicine cats always have to remember to wash their paws in a body of water, such as a creek or stream, after using mouse bile. Nettle Seed-Green, spiny seeds. Like yarrow, can be used if a cat has swallowed poison. Parsley-Stops a queen from producing milk if her kits die, don't need milk anymore, or are producing too much milk. Poppy Seeds-Small black seeds that are shaken out of a dried poppy flower head. They can put a cat to sleep, or soothe shock and distress, but is not recommended for nursing queens. They are given by wetting the paw, pressing on them, causing them to stick to the paw, and then having the sick or injured cat lick them off. Another method is to place them on a leaf, and have the sick or injured cat lick them off there. They also help soothe pain. Ragwort Leaves-Crushed and mixed into a poultice with juniper berries, it can help aching joints. It can also be used to keep a cat's strength up. Ragweed-Like lamb's ear, this herb, commonly found in the mountains, gives a cat strength. Raspberry Leaves-A herb used in kittings. It is a painkiller and can help stop bleeding during the kitting. Rosemary-A soothing herb-soothes wounds, scratches, and broken bones. Occasionly used in kitting as it soothing can calm queens down-but it is not recommended. Rush-This herb is used to bind broken bones. It has long narrow leaves and lavender colored head stalks. Snakeroot-The best remedy for poison, especially for snake bites. Sorrel-Similar to dock, the leaves can be chewed up and applied to soothe scratches, although it may sting when being applied to a wound, and it has a very tangy scent and taste. It is also used as a travelling herb. Stinging Nettle-The leaves, when applied to a wound, can bring down swelling. The spiny green seeds can be given to a cat who has been poisoned by crowfood, Twoleg waste, or other toxic objects. Tansy-The tansy plant has round, yellow leaves, and a very sweet and strong smell, making it good at disguising a cat's scent. It is used for curing coughs, but must be eaten in small doses. Tormentil-This root is good for all wounds and expelling poison. It has a strong romantic scent to it and a sharp taste. Thyme-This herb can be eaten to calm nervousness, anxiety, and cats who are in shock. Traveling Herbs-Traveling Herbs consists of sorrel, daisy, chamomile and burnet. Watermint-A green, leafy plant found in streams or damp earth. Usually chewed into a pulp and fed to cats with suffering from a bellyache. Wild Garlic-When rolled in, it can help prevent infection. Especially good for rat bites. Due to its strong smell, it is good at hiding the scent of a certain Clan, and disguising cats on raids. Willow Bark-This bark serves as a painkiller. Wintergreen-Commonly found in the mountains, helps soothe and heal wounds as well as stop infection. Yarrow-A flowering plant whose leaves can be made into a poultice, and applied to wounds to extract poison. Also will make a cat vomit. The ointment of yarrow can also be used to soften and help heal cracked paw pads. Nightshade-Nightshade is extremely toxic to cats and Twolegs, being capable of killing a full-grown Twoleg in under forty-five minutes and even less for cats, especially kits and elders. Deathberries/Yew berries/Night Seeds-Deathberries are an extremely poisonous species of red berries, and are known to Twolegs as yew berries. Can easily kill kits and elders. Holly Berries-Holly berries, while not as dangerous as deathberries, are still a danger to kits. Foxglove Seeds-Foxglove seeds are known to be a dangerous medicine. While they can help the heart, they can easily cause paralysis and heart failure. They are often mistaken for poppy seeds. Okay. Let's do this!... It might take a while lol. Yeah but we need to get some of this work done. Bella is in a play on the 22nd and I saw her, Raven and Ice at a lake party and later at Ravens house yesterday. I think that Ravens younger brother might join as he was curious to the website, so be aware of that. Ok so lets begin! I shall list how easy it is to find them, I guess. There is easy, medium, hard, and non-existant on the islands. There all done! I was thinking that maybe we shouldn't do the locations for the herbs. So anyway, Do you want to do how easy it is to find the poisons? Deathberries/Yew berries/Night Seeds- Medium to find. Holly Berries- Medium to find. Foxglove Seeds- Medium to find. Also you can die of redfever, but you can't die of the other fevers. You can become crazy from purplefever and you can lose feeling in your body parts as a result of bluefever but purplefever can't kill you and neither can bluefever. I think we are done. I will post this stuff up soon. Should I post it in Roleplay or Problems and Issues or somewhere else? Thanks it is a picture of a demon called the Kishin. His name is Asura and he is basically Madness. He is from SoulEater. In the anime he dies and is killed but in the manga he is still alive as the anime stopped and the manag kept on going. I thought the roleplay too. I will post it there. Cool. I need to watch/read that sometime.